Well, folks, I did it. After months of anticipation, I finally made the infamous Momofuku birthday cake. You know, that 6″ “naked” style beauty? 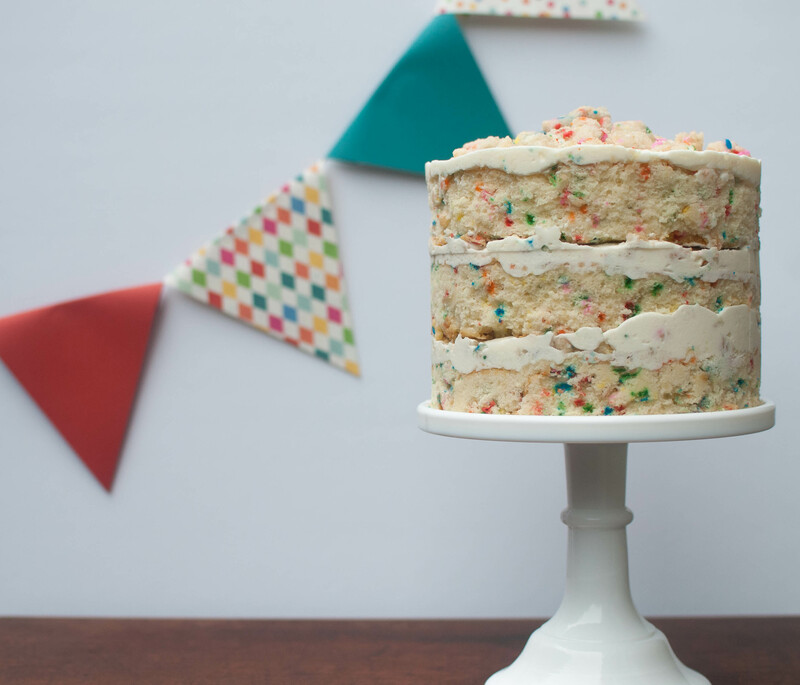 Confession: I actually made this cake at the end of last month. I stashed it away in the freezer and served it at a birthday brunch I hosted two weekends ago, then proceeded to procrastinate all week, then have a mental breakdown when Lightroom lost some of my precious process photos and then… procrastinate yet another week–which is why I am just sharing this with you now. 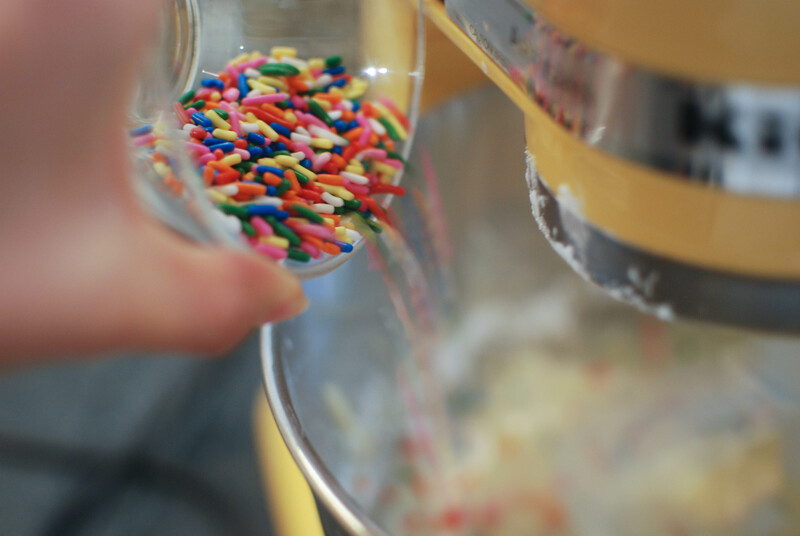 Buckle your seat belts, ’cause this is gonna be quite a large and sprinkle-filled post. 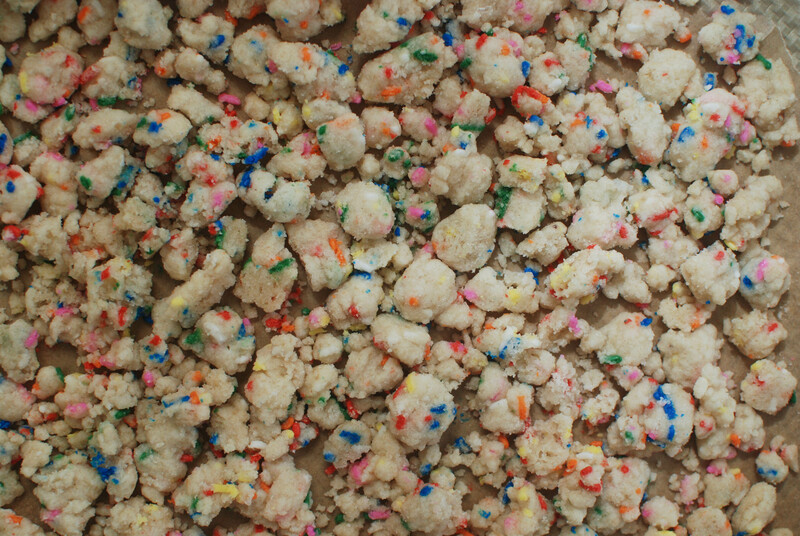 Now, this cake has essentially 4 parts: The cake itself, the (incredibly silky and gorgeously white) frosting, the birthday cake crumbs (which are pretty much just crunchy confetti mini cookies and make an excellent snack in and of themselves), and a cake soak made out of milk and clear vanilla extract. Yes, it’s a project that’s not for the faint of heart. But I know you’re up for the challenge, and once you sink your teeth into that first dreamy bite, all will be worthwhile. A NOTE ON SOME OF THE UNCOMMON THINGS IN THIS CAKE: I found citric acid, liquid glucose, and clear vanilla all at Amazon for reasonable prices. I haven’t tested this cake without the small amounts called for of these things, but if you do let me know how things turn out! 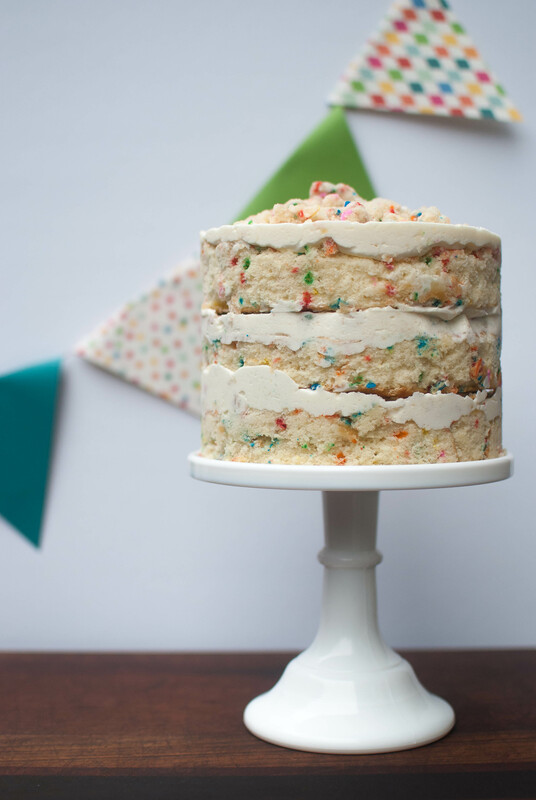 And about that clear imitation vanilla that you may be cringing at the thought of–this cake is so great because it seeks to emulate those out-of-the-box confetti cakes that remind everyone everywhere of their childhood. The clear vanilla is essential in this! It’s what makes this cake special. The cake also requires a 6-inch cake ring and some 3 by 20-inch strips of acetate, both of which can also be found on Amazon. However, Molly over at My Name Is Yeh was able to use a tomato can to achieve a similar effect. Let’s go ahead and start with the cake itself. 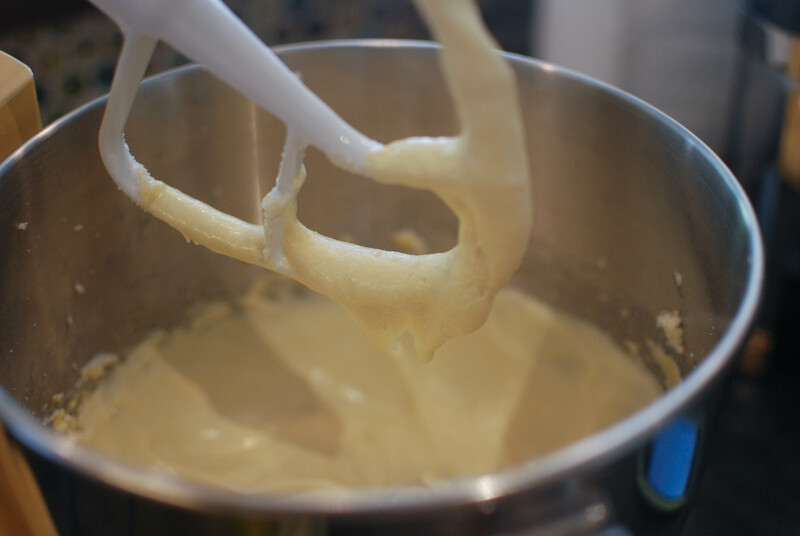 In the bowl of an electric mixer, combine some butter, shortening, light brown sugar and white sugar and cream on medium-high for 2-3 minutes. Scrape down the bowl, crack in 3 eggs, then return the mixer to medium-high for another 2-3 minutes. NOTE: I don’t usually abide by suggested mixing times, but I decided to set timers for this recipe and the result was just about perfect. Next, scrape down the bowl again and set the mixer to low speed. 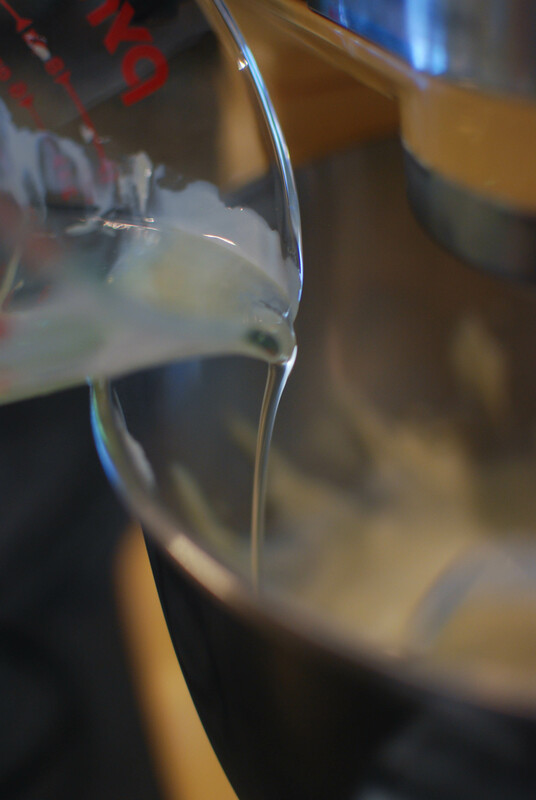 Gradually stream in some oil, buttermilk, and clear vanilla (I used Wilton). Increase your speed to medium-high and mix for 4-6 minutes. You’re forcing a lot of liquid into a fatty mixture, so you want to continue to beat until the batter is almost white, with no more fatty or liquidy streaks. 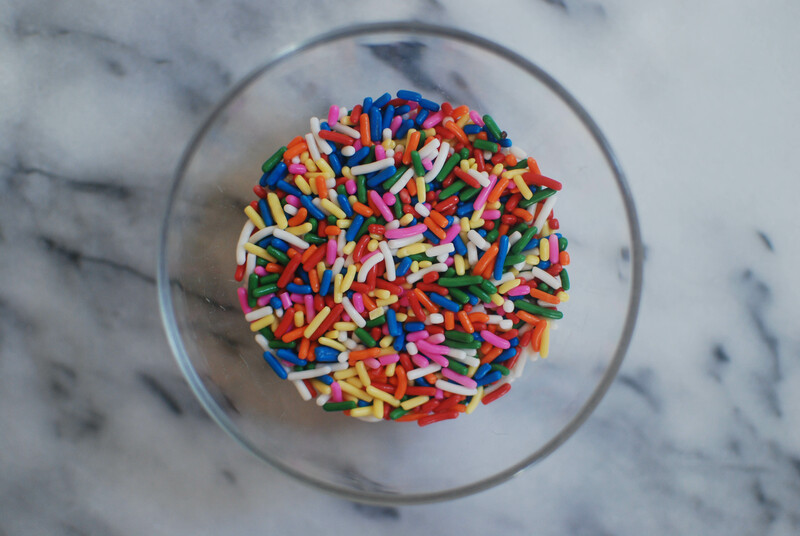 And sprinkles! Mix for about a minute, until the batter just comes together. Scrape the bowl as needed. Bake it for at 350 F for 30-35 minutes, or until the edges of the cake bounce back a little when gently prodded and the middle is set. Cool on a wire rack while you make the other components! 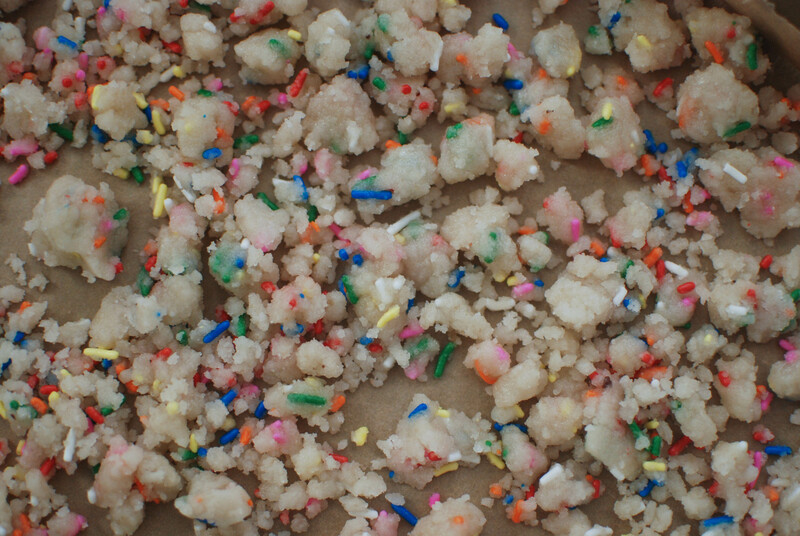 Next up we’ll make the birthday crumbs. Lower your oven temp to 300 F and combine some sprinkles, cake flour, brown sugar, white sugar, baking powder, and salt in the bowl of an electric mixer. 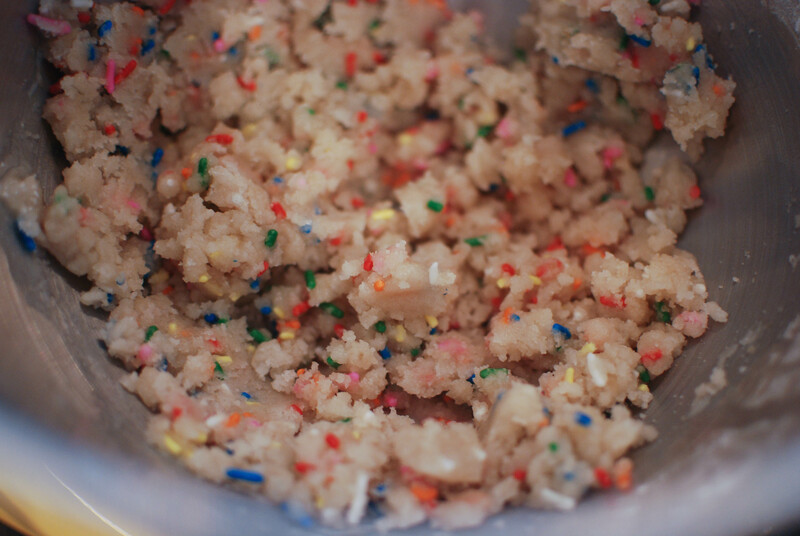 Add in some grapeseed oil and vanilla and mix until the mixture forms clumps, like this! And bake them for around 15 minutes. Let cool and move on to the frosting. 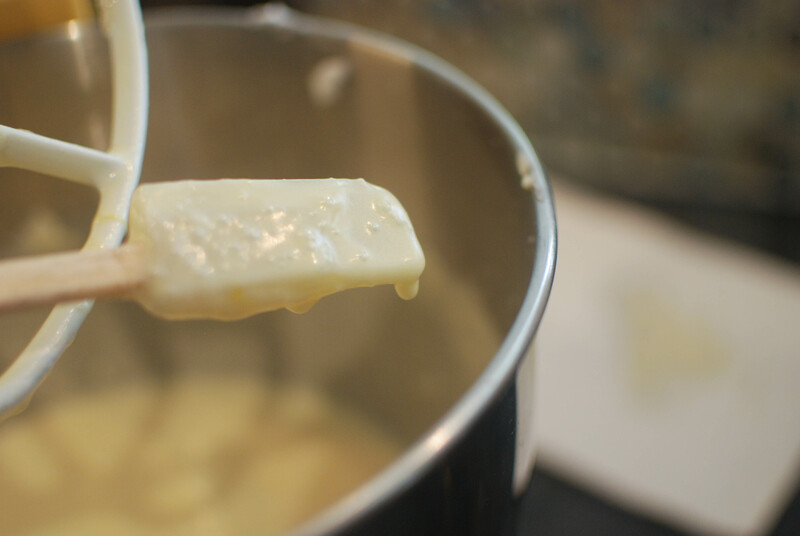 We’re working with 3 types of fat here: shortening, buttah, and cream cheese. Just trust me on this one. 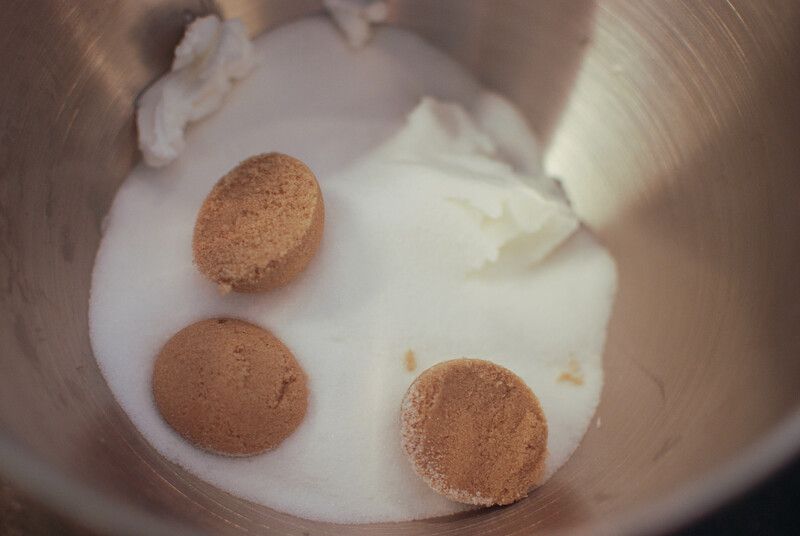 Cream these together on medium-high for 2-3 minutes, until your mixture is nice and fluffy. Scrape the bowl, turn the mixer to low, and gradually stream in some liquid glucose, corn syrup, and clear vanilla. Turn the mixer to high and beat for 2-3 minutes. Your frosting should be smooth, white and glossy. Scrape down the bowl and add in some confectioners’ sugar, salt, baking powder and a pinch of citric acid. Stir together on low speed, then turn the mixer back up to high for 2-3 minutes until the frosting is bright white and smooth. You’re almost ready for the assembly. For the cake soak, I’m going to ask you to do something super complex. You may not get it right on the first try, but that’s totally okay. Ready? Whisk together some milk and clear vanilla. Yep, that’s it. And peel the top layer of parchment away. 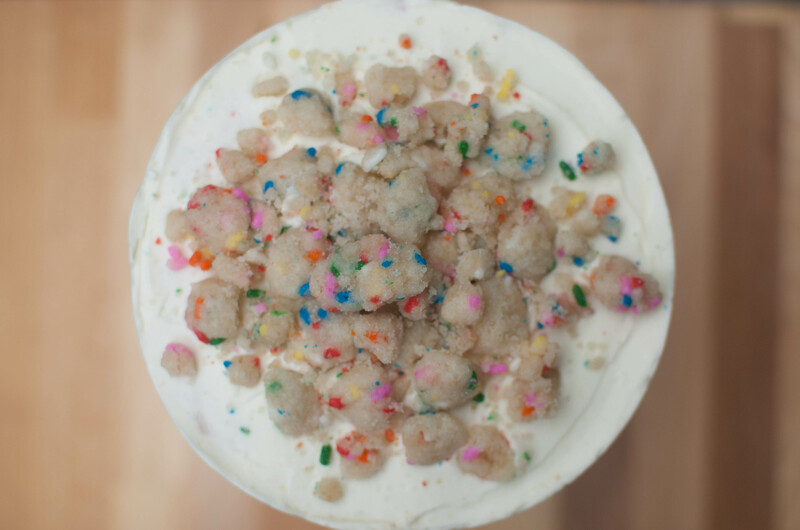 Look at all of those sprinkles! Use a 6-inch cake ring to cut out 2 circles, then cut half circles in the leftover cake. Look at the fluffiness! Try to stop yourself from tasting a crumb. I dare you. Place the cleaned cake ring on a piece of parchment that’s been put inside a rimmed baking sheet and line the ring with a 3-inch high strip of acetate (clear plastic). To build the bottom layer, take the two halves you cut out and place them inside the cake ring, filling in the gaps with any extra cake. And top with one third of the crumbs (I actually used a bit less). 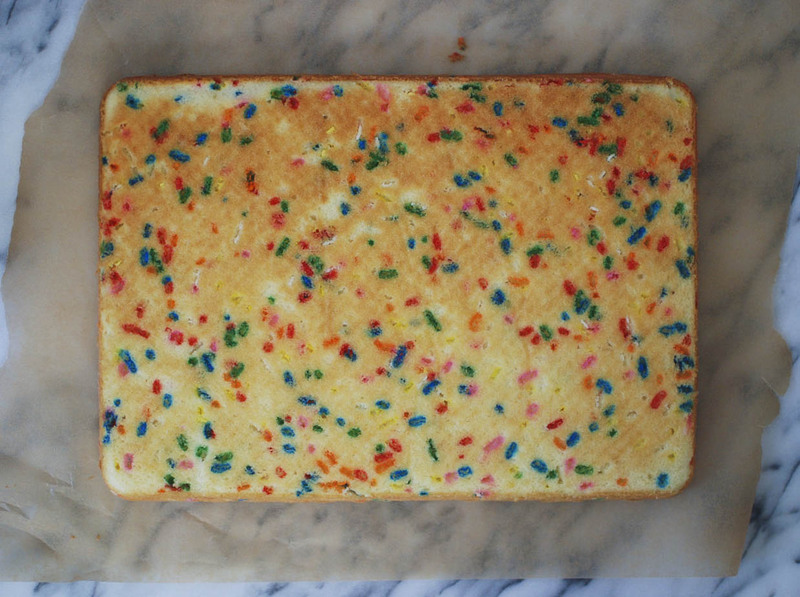 Spread on an even layer of another fifth of the frosting, then take another strip of acetate and tuck it between the former strip and the cake ring. Place another cake layer inside the ring and repeat the cake soak/frosting/crumbs/frosting process! 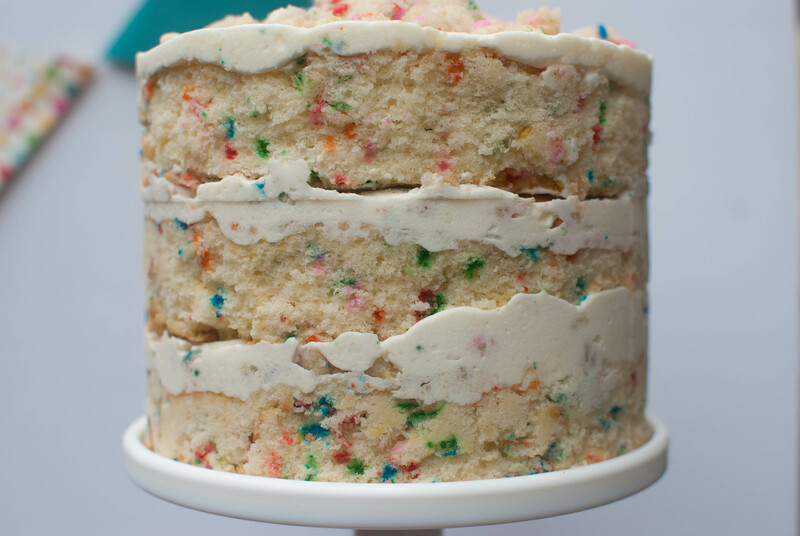 For the last layer, use up the last of the frosting in any way you want (I opted for a flat top), then decorate with the remaining birthday crumbs. 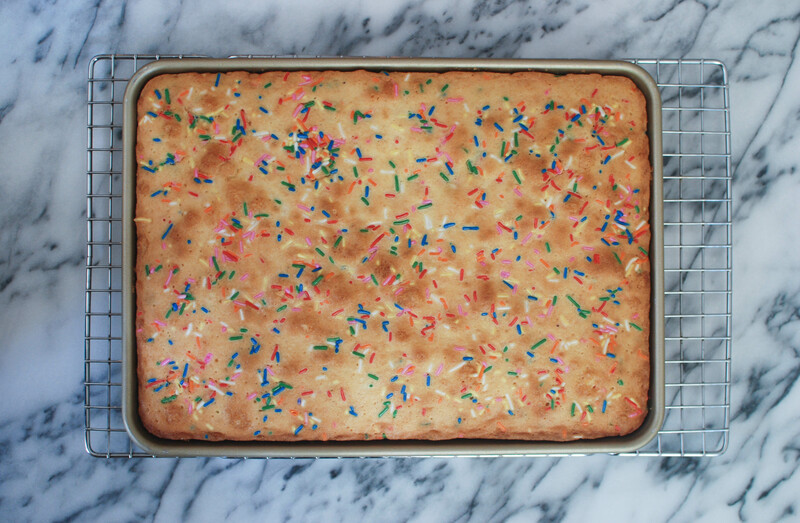 Place the sheet pan with the cake on it in the freezer for at least 12 hours so the cake can set. It’ll keep for up to 2 weeks, so this is the perfect make-ahead kind of project. 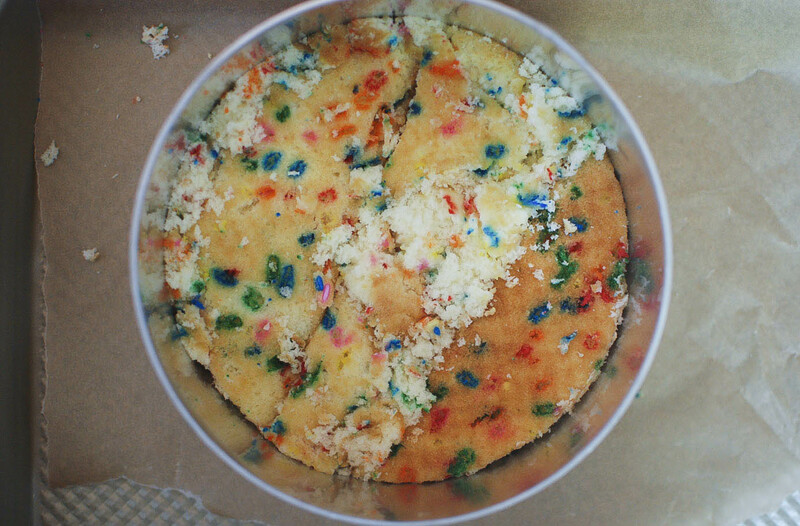 3 hours before you’re ready to serve, take the cake out of the freezer and pop it carefully out of the cake ring. Peel off the acetate and let it defrost in the fridge. You’re done! Cake is love, cake is life. Enjoy this one, guys! Please let me know if you decide to make this–I’d love to see photos! 2. In the bowl of an electric mixer, combine butter, shortening, light brown sugar and white sugar and cream on medium-high for 2-3 minutes. 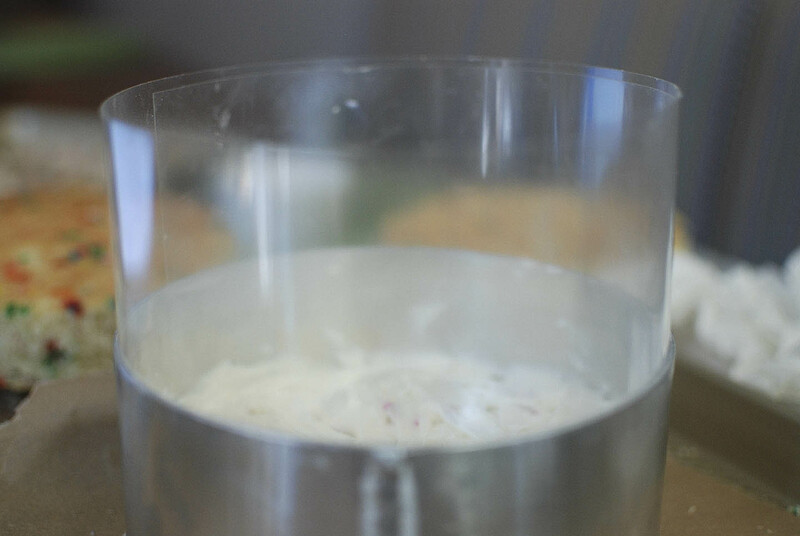 Scrape down the bowl, crack in eggs, then return the mixer to medium-high for another 2-3 minutes. NOTE: I don’t usually abide by suggested mixing times, but I decided to set timers for this recipe and the result was just about perfect. 3. Scrape down the bowl again and set the mixer to low speed. Gradually stream in oil, buttermilk, and clear vanilla. Increase your speed to medium-high and mix for 4-6 minutes. You’re forcing a lot of liquid into a fatty mixture, so you want to continue to beat until the batter is almost white, with no more fatty or liquidy streaks. 4. Scrape down the bowl again, then set the speed to low and gradually add in cake flour, baking powder, salt and 1/4 cup sprinkles. Pour the batter into a quarter sheet pan that’s been sprayed with baking spray, then lined on the bottom with parchment (or you could use a Silpat). 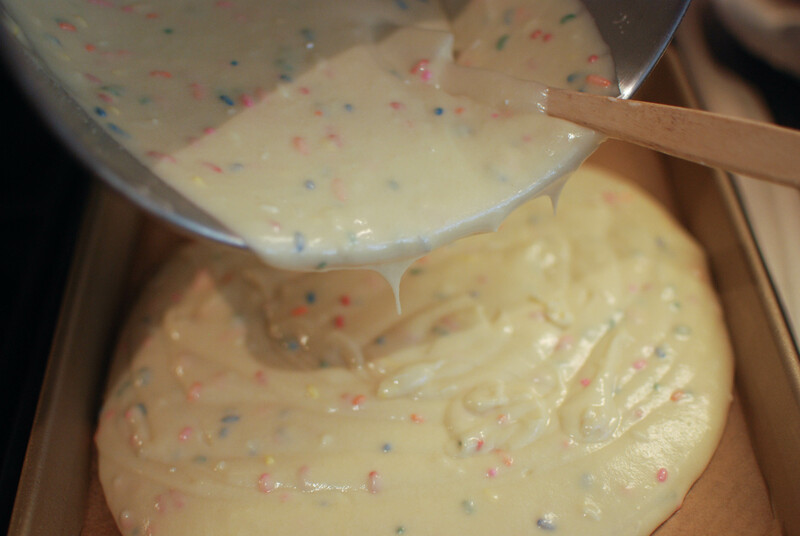 Spread it out evenly and top with 2 tablespoons of sprinkles. Bake for 30-35 minutes, or until the edges of the cake bounce back a little when gently prodded and the middle is set. Cool in the pan on a wire rack. The cake will keep for up to 5 days in the fridge. 1. Lower the oven to 300 F.
2. 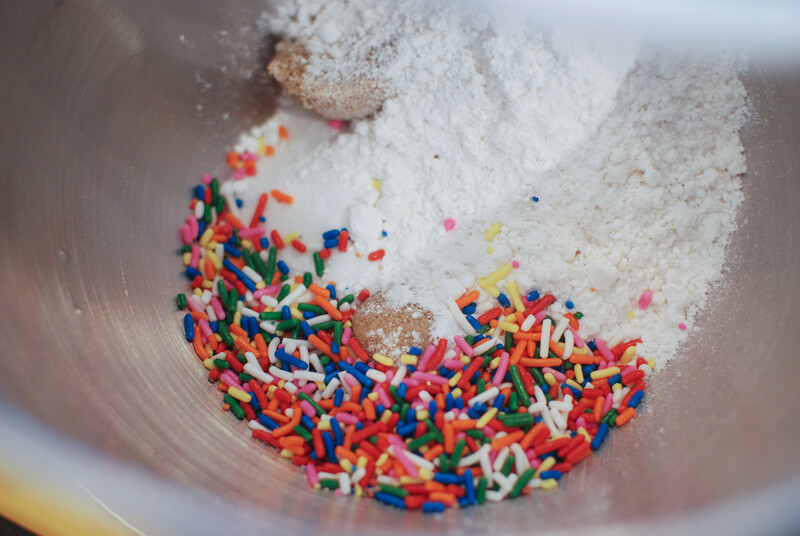 Combine some sprinkles, cake flour, brown sugar, white sugar, baking powder, and salt in the bowl of an electric mixer. 3. Add in grapeseed oil and vanilla and mix on low until the mixture forms clumps and clusters. Bake for 15 minutes and let cool. If not using right away, store them in an airtight container at room temperature for a week or in the fridge or freezer for a month. 1. 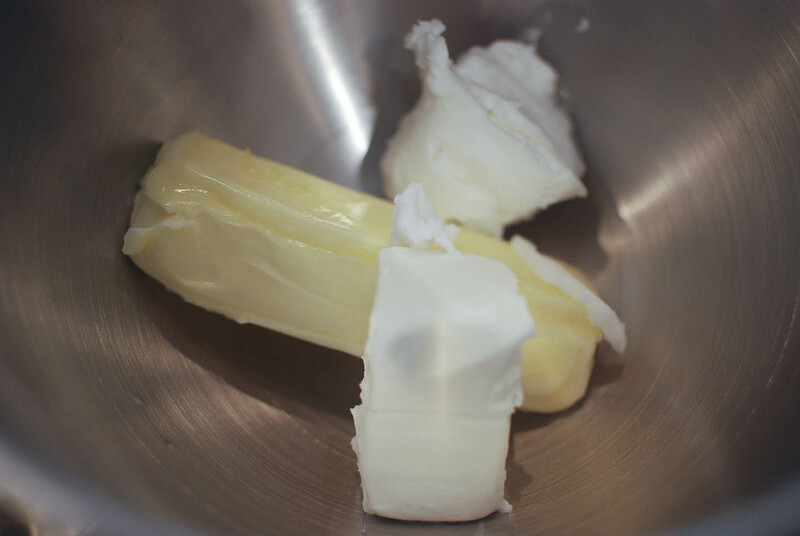 In the bowl of an electric mixer, cream the butter, cream cheese and shortening together on medium-high for 2-3 minutes, until your mixture is nice and fluffy. 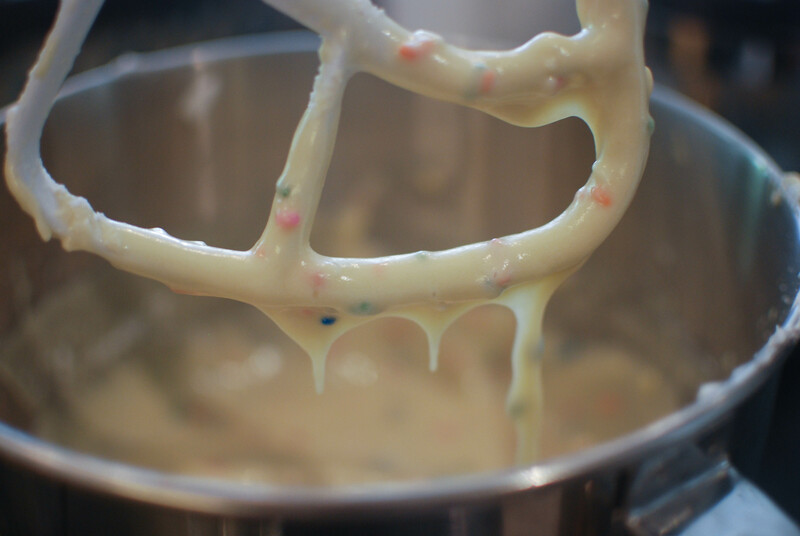 Scrape the bowl, turn the mixer to low, and gradually stream in the liquid glucose, corn syrup, and clear vanilla. Turn the mixer to high and beat for 2-3 minutes. 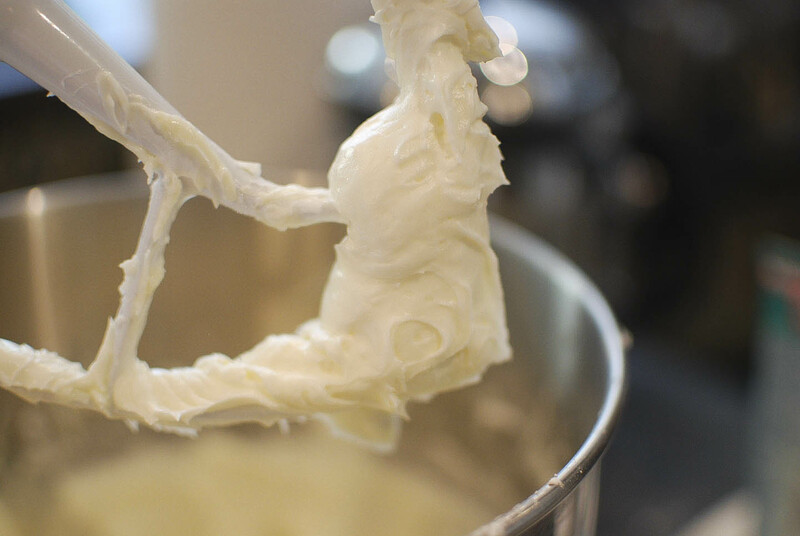 Your frosting should be smooth, white and glossy. 2. Scrape down the bowl and add in the confectioners’ sugar, salt, baking powder and citric acid. 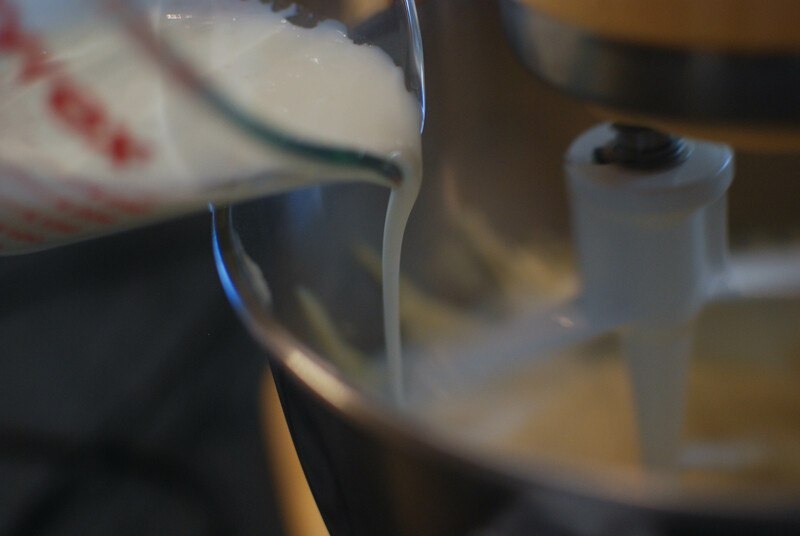 Stir together on low speed, then turn the mixer back up to high for 2-3 minutes until the frosting is bright white and smooth. The frosting will keep in a container in the fridge for up to a week. 1. In a small bowl, whisk together the milk and vanilla. 1. 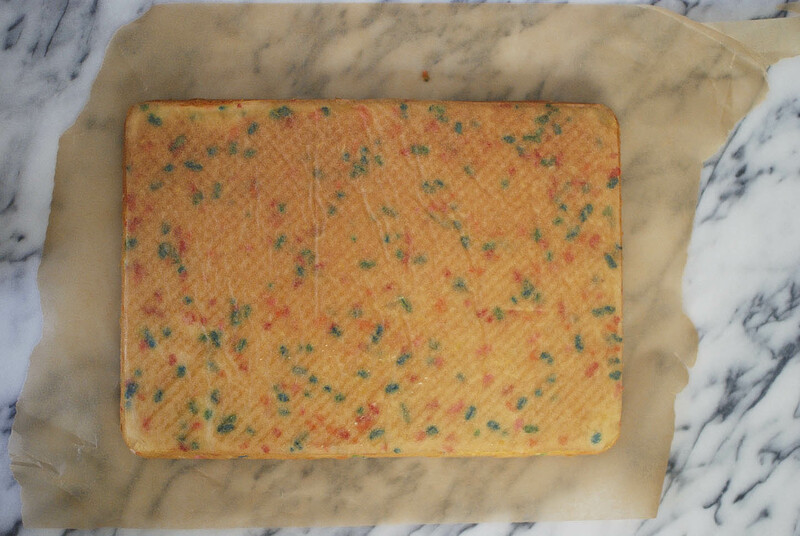 Turn your cake out onto a piece of parchment and peel the top layer of parchment away. 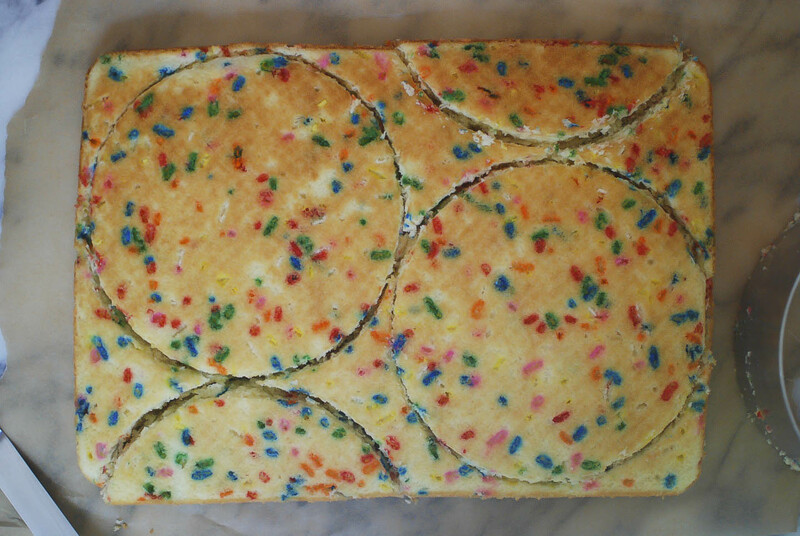 Use a 6-inch cake ring to cut out 2 circles, then cut half circles in the leftover cake (refer to the images above). 2. Place the cleaned cake ring on a piece of parchment that’s been put inside a rimmed baking sheet and line the ring with a strip of acetate. To build the bottom layer, take the two halves you cut out and place them inside the cake ring, filling in the gaps with any extra cake. 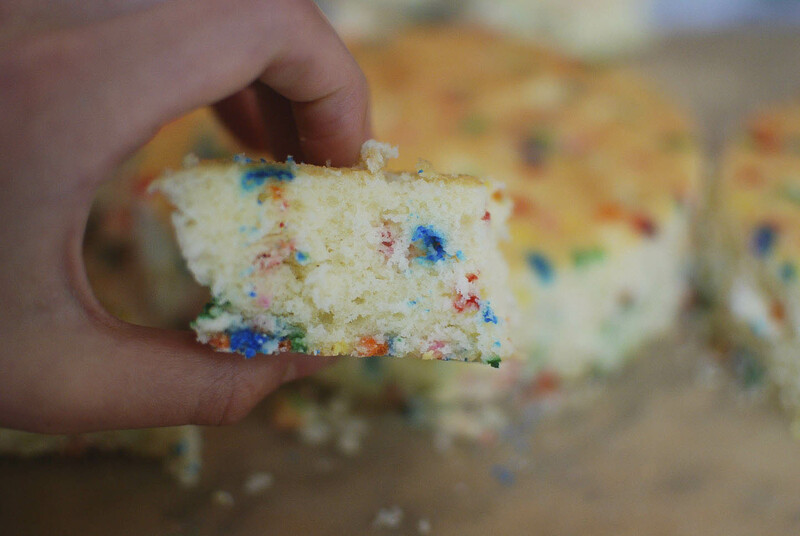 Use a pastry brush to layer on about half of the cake soak. 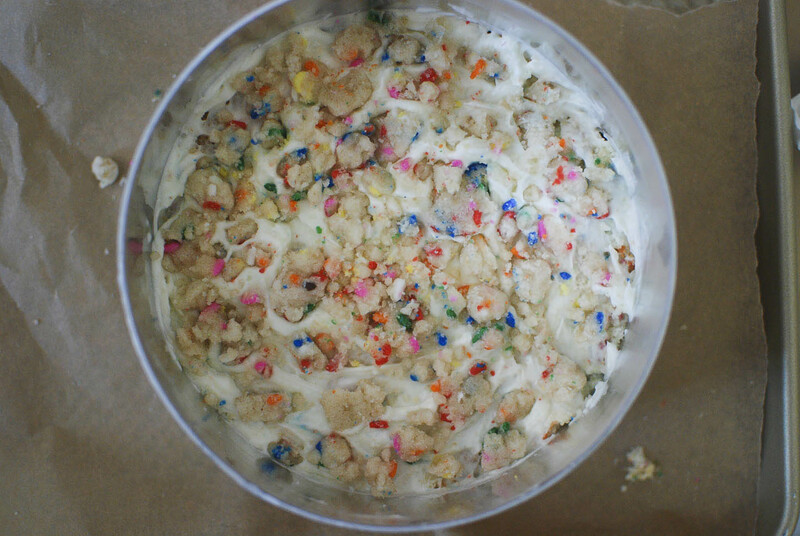 Spread on one fifth of the frosting and top with one third of the crumbs (I actually used a bit less). 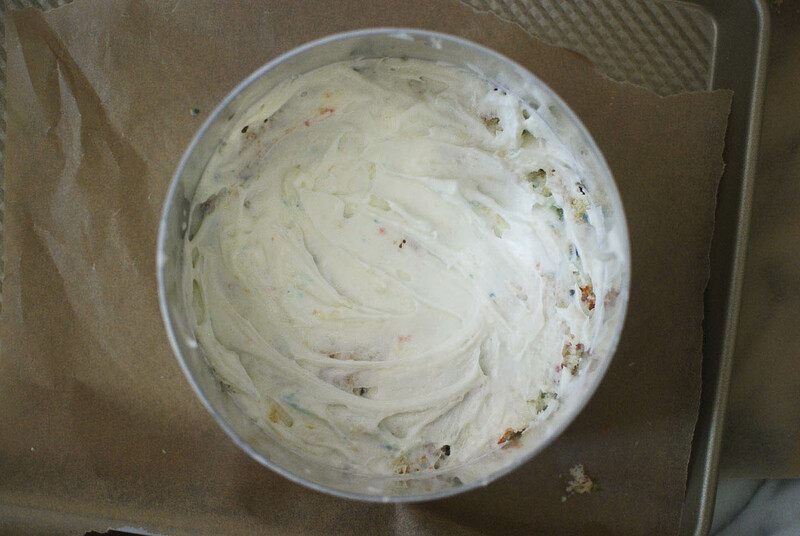 Spread on an even layer of another fifth of the frosting, then take another strip of acetate and tuck it between the former strip and the cake ring. Place another cake layer inside the ring and repeat the cake soak/frosting/crumbs/frosting process. 3. 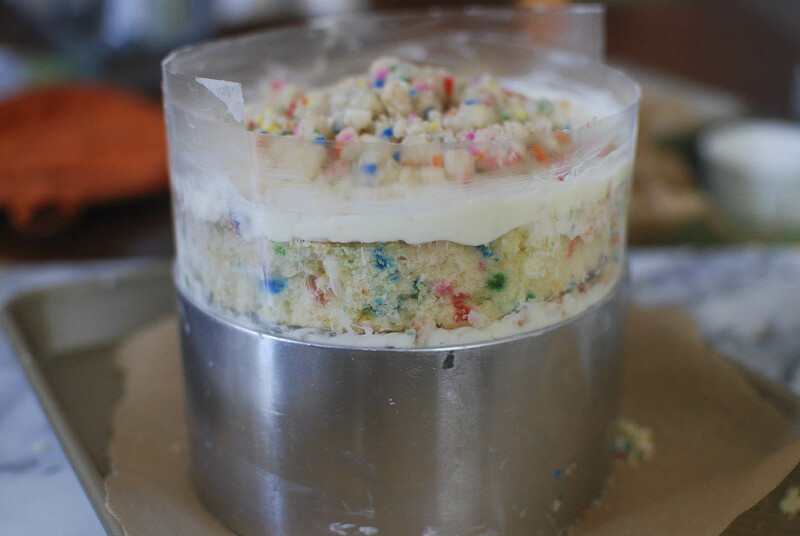 For the last layer, use up the last of the frosting in any way you want (I opted for a flat top), then decorate with the remaining birthday crumbs. 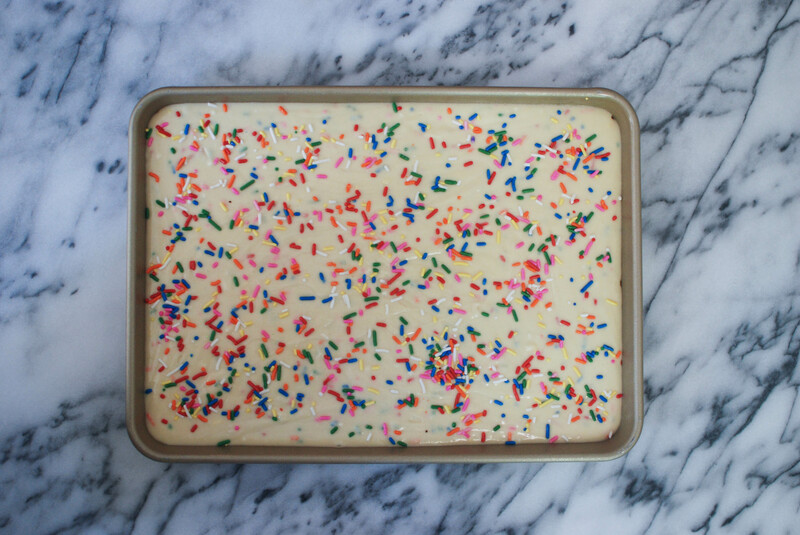 Place the sheet pan with the cake on it in the freezer for at least 12 hours so the cake can set. It’ll keep for up to 2 weeks in the freezer, or 5 days in the fridge (wrapped tightly in plastic wrap). 4. 3 hours before you’re ready to serve, take the cake out of the freezer and pop it carefully out of the cake ring. Peel off the acetate and let it defrost in the fridge. Happy Monday and happy nibbling! I would love for you to move to Chicago to help me with all my upcoming parties!!! Any ideas are appreciated! You are amazing! This look is so “cool”. P.S. — I have an extra bedroom and the schools are great here! Oh, I’ve REALLY wondered about this recipe, I’ve had it saved for months. You’re making it really seem worth it to buy the extra ingredients and materials, it looks GLORIOUS. Thank you for sharing your results! wow, just catching up on some older posts. This is an amazing looking cake, beautiful! !